The 3M Perfect-It EX AC All Coatings was developed for a variety of difficult-to-buff coatings. The compound is designed with a unique formula and new minerals to help remove sand scratches and other surface defects quickly. The Perfect-It Paint Finishing family delivers additional wet time and excellent cut, allowing technicians to use less material, while providing easy clean-up and helping to reduce overall cycle time. 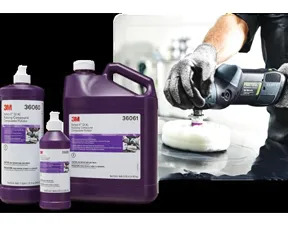 The product line is designed to make it easy and efficient for collision repair professionals and detailers to use the Right product – with the right pad – for the best results.